Ethan Schmidt, a history professor at Delta State University, died Monday. CLEVELAND, Miss. — A professor was killed in his office at Delta State University in Mississippi, forcing terrified students and teachers to hunker down in classrooms as investigators searched for another school employee in connection with the killing, officials said Monday. Cleveland Police Chief Charles "Buster'' Bingham said during a news conference that authorities have identified Shannon Lamb as a "person of interest'' in the shooting of history professor Ethan Schmidt. Lamb is no longer believed to be on the Delta State campus. Bingham also said police have information suggesting Lamb may have been involved in another slaying in the south Mississippi city of Gautier, about 300 miles (480 kilometres) away. Gautier police spokesman Matthew Hoggatt told The Sun Herald that a woman was found dead in her home, and that Lamb is the suspect in her death. Mississippi Highway Patrol spokesman Johnny Poulos said investigators are searching for a Dodge car that they believe Lamb is driving. The 3,500-student university in Cleveland, in Mississippi's Delta region near the Arkansas-Mississippi state line, was first put on lockdown around 10:45 a.m. amid reports of an active shooter. Everyone on campus was told to take shelter, away from windows. "A few minutes into the class, we heard these popping noises and we all went completely silent,'' he said. 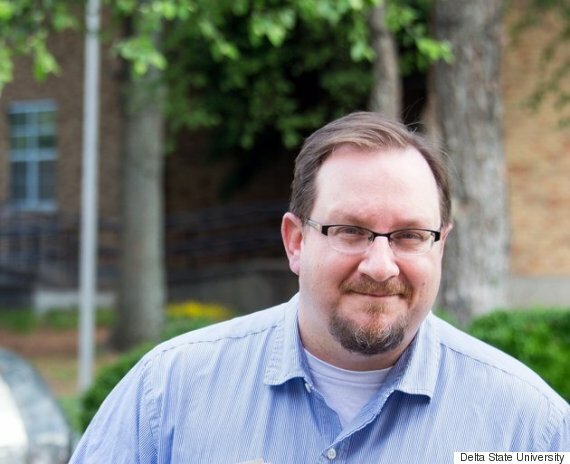 Professor Ethan Schmidt was shot to death at Delta State University on Sept. 14, 2015. Some people thought that it might be a desk or door closing or firecrackers, but King said he thought it sounded like gunshots. A few minutes later a police officer — gun drawn — burst into the windowless room and ordered everyone to get against the wall away from the door. Some people also hid in a storage closet, King said. The officer didn't explain what was going on, but King said the students understood. "We put two and two together,'' he said. The professor gave the students chairs to throw if the shooter came in, said King's friend, Christopher Walker Todd. Eventually police ushered the students into another building and questioned them about what they'd seen and how many shots they heard. Freshman Noah Joyner, 18, was in his dorm building when reports of an active shooter began to spread. He hunkered down in a bathroom and heard others desperate to get in. Charly Abraham was teaching a class of about 28 students at the university's Delta Music Institute when he and the students received a message through the university's alert system. "Everybody's phone just sort of went off at the same time,'' Abraham said. Then a staff member came in and told them that the campus was on lockdown. About two hours or so after the initial lockdown, about 25 heavily armed police officers swept through the building, Abraham said. All of the students were sent back to their dorms and other people such as faculty and students who live off campus were sent to the university's coliseum, Abraham said, though most were later allowed to leave. "Dr. Ethan Schmidt was a terrific family man, a good friend, a true son of Peabody, Kansas, and his beloved Emporia State University,'' he said. Pettus reported from Jackson. Associated Press writers Kevin McGill and Rebecca Santana in New Orleans Alina Hartounian in Phoenix and Roxana Hegeman in Wichita, Kansas, contributed to this report.